Bringing up Bella: Saturday's dog: Who wants a Cookie? Saturday's dog: Who wants a Cookie? Look at that face! So eager to please. Cookie is a sweet, 6-year-old Beagle boy who for some reason keeps getting overlooked at the shelter. Available through Buddy Dog Humane Society in Sudbury, MA, he would make a wonderful addition to an active home. Cookie loves to go for walks, loves running and playing fetch and, as you can see, absolutely LOVES his belly rubs. Mostly, he just wants a home of his own where he can stay close to his family - he's a real love bug and so cute, too. If you want to help spread the word about this lovable guy, I've made it easy for you: just click this --> or this --> . And thanks. 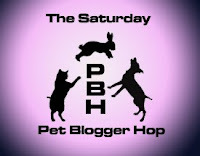 Thanks to Two Little Cavaliers, Life with Dogs, and Confessions of a Plume for hosting the Saturday Pet Blogger Hop. Cookie looks like a sweet boy! I'm sure somebody'll want something beagle-licious very soon for their family! Thank you Leslie -- great photos! And he *is* that cute! cookie is just a real sweetie! I hope she finds her loving forever home soon! What a handsome poochie and with such a sweet face. He must be gentle to let someone give him tummy rubs...come on, someone bring Cookies into a furever home! Thanks again. It's very much appreciated. He's adorable! I just know someone out there will scoop him up! Cookie looks a lot like mom's previous dog Mathilda! Here's hoping that he'll find his forever home soon! Cookie is a cutie:) Someone has got to have a space for a non-fattening sweetie like him! Saturday's dog - Lekoda adopted! Wherein Bella models her "thunder-wear"